Video tribute to Sister Val from when she received a Second Century Award in 2013. 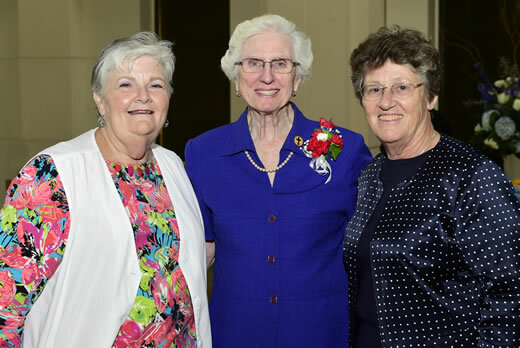 Sister Valentina Sheridan, the director of mission integration at Emory Saint Joseph's Hospital, has retired after more than 21 years of ministry to patients and families at the facility. Known to all as "Sister Val," the hospital celebrated her retirement with a reception attended by staff, physicians, volunteers and friends. Sister Valentina began working at Saint Joseph's Hospital in 1994 as the director of pastoral care, and was instrumental in shaping the continued growth and professionalization of that department at the hospital. Through the years, Sister Valentina used her gifts to help others both emotionally and spiritually, from her steady presence at the bedside of patients to providing words of support and encouragement to families. Since 2007, Sister Valentina has served as the hospital's first director of mission integration, continuing her ministry with patients and families as well as educating the staff and physicians about the Mercy Mission and traditions of the hospital. The message at Emory Saint Joseph's is that everyone who works at the hospital is an extension of the Mercy ministry. The Mercy Mission provides compassionate care in the spirit of loving service to those in need, with special attention to the poor and vulnerable, and these values have been central to Saint Joseph's since its founding by the Sisters of Mercy in 1880. A native of Macon, Ga., Sister Valentina began practicing works of mercy long before she entered the Sisters of Mercy religious community. As a young child, Sister Valentina's grandfather introduced her to the blessings of serving others in need. First, they would stop at church to light a candle and pray for each sick person they were going to visit, and then before leaving the church, they would put money in the poor box for the underserved. Sister Valentina graduated from Mount de Sales Academy and then entered the Sisters of Mercy religious community. She earned her bachelor's degree in elementary education administration from Mount Saint Agnes College in Baltimore, Md., and a master's in educational administration from the University of Dayton in Ohio. Sister Valentina was a teacher for 13 years before becoming principal of Sacred Heart School in Augusta, then principal of Our Lady of the Assumption School in Atlanta. She was named director, then superintendent of education for the Archdiocese of Atlanta. During Sister Valentina's career, she also served as a pastoral associate at Sacred Heart Church in downtown Atlanta, and later was appointed administrator of the church by the Archbishop. Sister Valentina received Emory Healthcare's Second Century Award in 2013, which honors community and hospital leaders whose vision and legacy have made an indelible impact on patients, families, staff and physicians. The award was renamed the Sister Valentina Sheridan award in her honor. In addition to her ministry at Emory Saint Joseph's, Sister Valentina has served on boards at Ignatius Retreat House, the Saint Joseph's Mercy Foundation and The Mission Effectiveness Committee.